Painting a house is a tough project, but the finished job can be quite rewarding. After you've put any remaining paint away and sat down with a glass of tea to enjoy watching it dry to a beautiful new finish, you think to yourself how wonderful it is that you won't have to paint again for a number of years. However, if you didn't pressure wash prior to painting, you'll be in for a pretty terrible surprise. 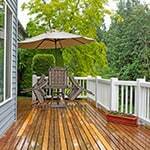 Foregoing pressure washing prior to painting will leave residue in place that won't allow the paint to fully stick. When chalky residues and dirt that weren't removed in the beginning start to come loose, they'll take the overlying paint off with it. Before you begin the deep cleaning process, you'll want to spray off any large, loose debris and wet the entire surface. Use a moderately high pressure tip that's strong enough to break up dirt and debris, but not so much pressure that you damage your siding. In most cases, this will be your green (25-degree fan) tip or your yellow (15-degree fan) tip. Red tips (0-degree) are extremely concentrated and should not be used for siding. Red tips can severely damage your siding. To be safe, use a yellow or green tip and stand back about ten feet to start, then move in closer for more impact. The closer you get, the more pressure you'll apply, because the pressure is lost as it gets further from the spray gun. Once you find an adequate pressure and distance, keep it in mind for step three. You'll use the same amount of pressure again. Be sure to cover all areas that you'll be painting, and try not to miss any spots. If you do miss a spot, you'll be able to tell. Using a low-pressure tip, such as a 4.0 size tip (typically a black tip) or a 40-degree white tip, apply detergent using your detergent tank or a separate bucket of detergent. Some pressure washers may include a tip specifically designed for detergents, which may be labeled "soap." Using the soap tip, evenly spray the detergent/water mixture in an upward sweeping motion. This will help to evenly distribute the solution. 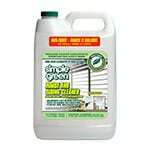 Make sure you're using an eco-friendly detergent with a neutral pH, as this will be less damaging to your siding and surrounding plants. If the weather is not too hot, and there's no direct sunlight, you can leave the detergent solution to settle for about 10 minutes. If it is especially hot out, or there's direct sunlight on the area you're cleaning, the solution will dry too quickly and should be reapplied after a few minutes or rinsed sooner. Now that you've sprayed away the large debris, applied your detergent solution, and allowed it to loosen the remaining deep-down dirt, it's time to clean it up and see how it looks. Return to the high pressure settings you used before to safely remove stuck-on crud without damaging your siding. Start from where you first applied the detergent, and work your way through the same pattern, spraying in an upward sweeping motion. Rinse until all of the detergent and dirt appears to be gone. You may want to consider spot checking for anything that may have toughed out the pressure washer's spray. Make sure nothing remains, and you'll be left with the cleanest, wettest house on the block. 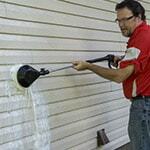 Once it's dry, there will be nothing left between your paint and your siding to keep them from adhering. Let all sides of your house dry completely before painting. This may seem obvious, but some sidings dry faster than others. If you're working on wood siding, it'll take significantly longer to dry than vinyl or aluminum siding. Wait until all bare wood feels completely dry to the touch. Wood siding should be left for at least 24 hours to dry. You don't want to trap moisture under the paint. Once dry, you can begin painting. This process of cleaning and drying your home before painting will ensure that the paint job lasts much longer. Painting without pressure washing may only last 2-3 years, whereas painting after a thorough pressure washing may last up to 7 years. Pressure Washing a Home Before Painting.. Our Power Equipment Direct how-to library can help you learn about Proposition 65 Product Labeling, Sales Tax Information and Product Recalls for Pressure Washer Equipment.